Except for tap water from the very largest municipalities that "purify" water with chloramine (not chlorine), your tap water almost certainly will suffice for growing microgreens. So you might consider not jumping into The Water, and instead skipping ahead to Warmth and Germination. When you garden indoors, you are a weatherman. Rather than merely predict rain, you make it happen. As a home gardener, you might already have compared the results of various soils, or of varying temperatures, or of several cultivars of the same species of seeds, but probably not of water from different sources. You can laboriously analyze water in a lab, and cautiously sip it, and delicately immerse your elbow in it, and luxuriantly bathe in it, and daringly dive into it, and yet still gain little insight as to whether it is suitable for your crops. Regardless whether municipal tap water or bottled spring water or gathered rain water or pumped up well water or piped in pond water or melted down winter snow, water quality is best judged by the results. And the results are microgreens. Do a taste test. Grow two batches of seeds in the same soil under identical conditions of light and darkness and warmth, but not of water. Hydrate one with water from your faucet, and the other with water from an alternative source, for instance bottled spring water. After two weeks, do they look the same? If not, if the greens hydrated with tap water are slightly yellow or curled, but the other batch not, then chlorine is to blame. Or if the two batches of microgreens look the same, next conduct an animal experiment, the animal being you. Do they taste the same? Modify your tap water if evidence of yellowish leaves or curled leaves or your taste test provides incentive for that. Chlorine is the predominate additive to municipal tap water that affects microgreens. While chlorine has long been added to tap water to kill bacteria, now in the 21st century the levels far exceed those of past decades. To rid chlorine, fill a wide-mouthed open container such as a bucket with your chlorinated tap water, and allow it to sit for one day, during which the chlorine will evaporate. Chlorine’s volatility accounts for the strong chlorine odor around indoor swimming pools, which you often can smell long before you’ve entered the locker room. Alternatively, activated charcoal filters effectively trap chlorine. Filters compared to buckets are more convenient and their effects more immediate, but filters are costly and must be replaced, while buckets are cheap and can be reused, again and again. Be wary of chlorine’s alkalinity, in addition to chlorine’s toxicity. Chlorine as an alkali affects water’s pH. The letters pH mean potential Hydrogen. (Whatever that means!) Rather than an archetypal scale of 1 to 10, pH ranges from 0 to 14. Zero is ultra acid, 0.1 to 6.9 are acidic, 7 is neutral, 7.1 to 13.9 are alkaline, and 14 is extreme alkaline. Distilled water in a warm room at 77 degrees F. (25 C.) is neutral 7, but distilled water does not exist in nature, and temperature affects its pH. The additive chlorine turns water alkaline, usually between 7.1 and 8, which can inhibit seed germination. Do your seeds routinely show slow or poor germination regardless of ambient temperature? Do your seedlings tend to rot regardless of rooting medium and frugal watering? Alkaline water may be the culprit, chlorine may be its source, and lemon juice can be its remedy. Most edible greens thrive with water between slightly acidic 5.5 to neutral 7. 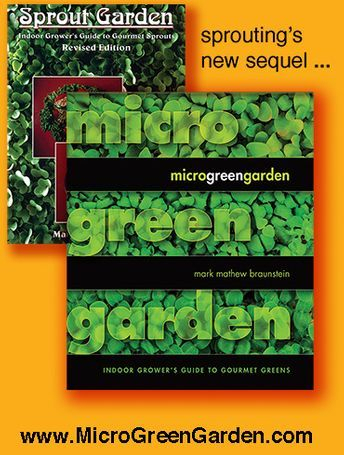 Microgreens, as the early stages of greens, generally thrive with water more narrowly between 6 and 6.5. If your water scores above 7, then to lower its pH you should consider taking action. Test your water’s or soil’s alkalinity or acidity with pH kits from gardening stores. These come either as strips of litmus paper to dip into the water, or as vials of liquid to mix with the water. Strips are more convenient, and while you’re at it, use strips to test also your soil’s pH. Most veggies grow best in soils whose pH ranges between 6.0 and 7.5, almost the same as for water. Most microgreens thrive in soils with pH more narrowly between 6.0 and 6.5, exactly the same as for water. Acidic (also called sour) soil can be balanced with lime (powdered limestone) or wood ash, and alkaline (also called sweet) soil with sulfur. Yet you need not be too concerned about the pH of your soil, because commercial potting soils are adjusted as needed. Except for acid rain, overly acidic water is rare. Baking soda can neutralize acidity, but must be administered very sparingly. Overly alkaline water is more common and can be less cautiously remedied. Vinegar or lemon juice are household foods that are acidic, so try adding very dilute amounts of either. Lemon juice is preferred. Precisely how much to add depends upon the acidity of the lemon juice and the alkalinity of the water. Prudence dictates to start with less than a quarter teaspoon per gallon of water. Then test again. Then if needed, add another quarter teaspoon. And test again. Be aware that a homegrown pH test kit comes in the form of sprouting, as sprouts bathe in water several times daily. If their germination and growth meet your expectations, then you are “good to grow.” Even if you do water with unfiltered chlorinated tap water, your little leafies still should flourish. The question to ponder is less about their survival, and more about their flavor, which comes later. Meanwhile you can ponder the flavor of your water right now. 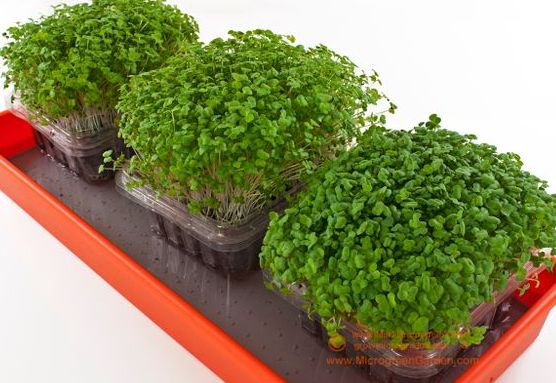 If its taste dissuades you from drinking it, then do not bathe your microgreens in it, because when you eat them you will be consuming the water anyway, just as microgreens. According to many environmentalists, an eco-apocalypse not only looms on our horizon, but already is unfolding. Of our burgeoning seven billion human family members, two billion of our brothers and sisters already are hungry, so food scarcity surely awaits our sons and daughters. Whether as an optimist or an alarmist, whether for feast or for famine, you are well prepared. Almost. If the power grid shuts down and turns off your fridge, you still can “turn on” the seeds you’ve stashed inside it. From outdoors, you can fetch soil for indoors. The sun always rises, including on mornings you might wish to stay in bed. But if your faucet runs dry, do you have a source of potable water? Microgreen gardening with water hauled from a stream or a spring, whether potable or polluted, is an experiment I have yet to conduct. Until you conduct it, you can lay up a reserve of water. In what? Repurposed plastic jugs in which spring water is marketed would seem a logical choice. But they are made of PET (recycle number 1), whose plasticizer migrates into its liquid contents during prolonged storage. So such cisterns of water should not be repurposed for cisterns of water. Instead you can repurpose plastic containers made of more stable HDPE (recycle number 2). Vinegar is bottled in HDPE, whose gallon (3.8 L) jugs are thicker walled and so all the more suitable for long term storage of water. Choose white vinegar. Also called clear vinegar, it is not white like calves’ milk, but clear like water. A jug of vinegar costs as little as a jug of water, but you may scratch your head and wonder what the heck to do with all that vinegar. As it dissolves away residual soap, use it as a hair conditioner after shampoo. As it inhibits the growth of fungus, spray it around your tub or shower. For both reasons, add it to your laundry washer’s rinse cycle or into the fabric softener compartment of updated washers. At one cup (approximately 250 mL) of white vinegar per load of laundry, and 16 loads per gallon (3.8 L) jug, you’ll accrue a plentiful supply of jugs sooner than you might imagine. And before reuse, you can skip sanitizing them by washing them in vinegar! If your source for reserves is municipal tap water, its chlorine just might assure its long term safety. And yet, I refill my reserves solely with untreated water drawn from a well run by an electric pump. During power outages, usually lasting only one day though one lasted one week, I resort to my reserves and can attest that water stored for three years in HDPE jugs remains drinkable with no hint of plastic taste and no evidence of bacteria. Anecdotal or universal? Let’s hope entire communities never need to resort to their water reserves, if any exist. As for my well water, though long untested for contaminants, I drink it daily anyway. Well water is akin to Earth milk pumped from the breast of Mother Earth. For more than 26 years this Earth milk has nourished my sprouts and microgreens, and for more than 26 years all three have nourished me.